Ove has not had an easy life. He probably wouldn’t say that. Ove would probably say that his life had been fairly ordinary, and if people would just do the right thing more often, his life could have been easier. But people seem to have a way of disappointing him. Frustrating him. And he, alone, seems to have the singular gift of common sense in a mad world. This book follows this curmudgeonly character through a very difficult period of his life. It weaves back and forth from his present to his past, giving the reader a clear picture of an often misunderstood man. There is humor, and tragedy, and a range of strong emotions in between. Ove has new neighbors, and much of the book is centered around his interactions with those neighbors, and the ones who have been around for a lifetime. And a cat. Because what better companion for a bitter soul than a cat? Throughout the story we learn what makes Ove…..Ove. We learn about his simple, yet profound upbringing. Why he’s obsessed with Saabs. Why he has a love/hate relationship with so many people. His love for his wife, Sonja. His deepest wounds and his most glorious shining moments. All of these paint a picture of a man that, though gruff on the exterior, has a heart that might surprise you. In case it wasn’t obvious, I tried to be purposefully vague in my synopsis. I could tell you a lot more, but I hope that the brief description of the plot and the main character intrigue you enough to pick up this book for yourself. Because you should. I think, so far, it’s our best book club selection to date. I’ll be honest though, I didn’t finish it before our book club meeting. I had a lot going on personally that made it very NOT conducive to reading, and especially not a book like this. While I hated I missed out on really diving into our discussion, I’m glad I waited until I was in a better frame of mind to finish it and fully appreciate the profoundness of some of the subject matter. That’s the thing about this book: it’s really an easy read, but it has so many strong messages. It also made me laugh out loud, a rare occurrence when I’m reading. I laugh when I read, but it’s always more of an internal chuckle. But there are places in this story that I couldn’t help but at least proclaim, “Ha!” when reading a statement or two. I love the way the book was written. Each chapter a story unto itself. In that way, it was easy to lay down and pick back up. The characters are just rich enough to not take away from the title character and give an overall picture of Ove’s life that is both complex and relatable. I appreciate writing that can do difficult things. The transitions from past to present without feeling choppy and disjointed, the overlay of characters without becoming saturated and lost. The underlying plot that is ever-present, yet remains far enough away for the reader to appreciate what is happening in the story in that particular moment. These are not elements that are easy to achieve, and while I would say this is an “easy” read, the writing is anything but simple. 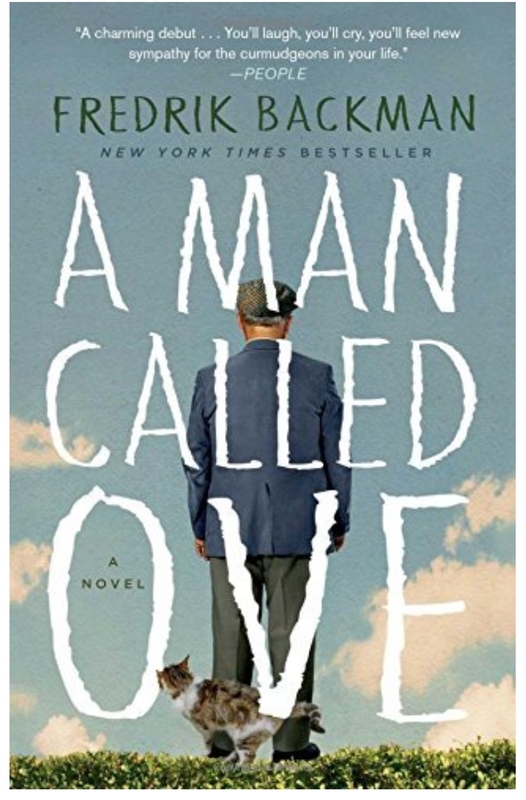 A Man Called Ove is, at its heart, a love story. And the kind of love story that is both beautiful and realistic. Ove and his wife experienced many ups and downs. But despite how different they were, their level of devotion to one another was inspirational and a testament to the fact that love, even when, and maybe especially when, we love those who appear difficult to love, the impact can be both lifelong and far-reaching. Loving someone is like moving into a house,” Sonja used to say. “At first you fall in love with all the new things, amazed every morning that all this belongs to you, as if fearing that someone would suddenly come rushing in through the door to explain that a terrible mistake had been made, you weren’t actually supposed to live in a wonderful place like this. Then over the years the walls become weathered, the wood splinters here and there, and you start to love that house not so much because of all its perfection, but rather for its imperfections. You get to know all the nooks and crannies. How to avoid getting the key caught in the lock when it’s cold outside. Which of the floorboards flex slightly when one steps on them or exactly how to open the wardrobe doors without them creaking. These are the little secrets that make it your home. I judge a good read by a lot of things, but one of my highest forms of praise would be whether or not I’d read it again. And for this one, I would. Just to soak up more of the profoundness of the story that I feel like I missed by reading it when I was so personally troubled by some things and also my disjointed consumption of the book, reading half and then coming back to it much later to finish it. It can be read that way, but it wasn’t meant to be read that way. If you choose to read it, learn from my mistake and set other things aside and commit to finish this one over a shorter period of time. I think it will leave you quite moved. Y’all. I’ve slept since we last met. In fact, I’ve slept a lot. And I didn’t take notes at our meeting. Honestly, our discussion was good, but everyone really seemed to like the book and there wasn’t a whole lot of debate about any one thing. I think the story definitely touched all of us in one way or another, and I wasn’t the only one who felt as though it was quite possibly our best selection thus far. I promise to be a little more on top of things when we resume our meetings in August. I really won’t have a choice as our summer selection is an epic historical fiction novel that will require me to be much more organized when it comes time to write about it. In fact, I might post about it in segments. In any case, I hope you have enjoyed my reviews of our selections so far, and wish you a delightful summer of good reading.